Sumit Vishwakarma and some pint-sized Picassos. Sumit Vishwakarma is an iPad art advocate whose use been creating works of art on the iPad with a variety of different apps and styluses. His work has been featured at the first Mobile Art Festival in Los Angeles, the Apple flagship store in San Francisco and the Mobile Creativity & Innovation Symposium. 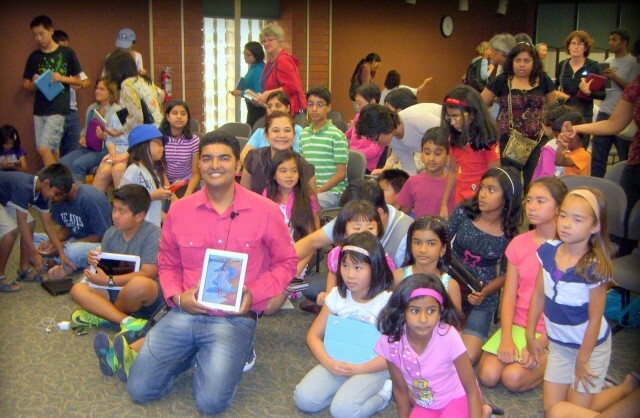 After teaching various workshops on how to embrace iPad art, Vishwakarma decided to open his own art academy in San Francisco with a goal to educate people of all ages on how to create simple digital techniques based on the traditional painting techniques artists have fine tuned for centuries. We talked to Vishwakarma about how the digital art world is maturing, what it takes to become a successful iPad artist, as well as how he’s giving kids a serious introduction to art through their favorite toy, the iPad. Cult of Mac: What apps do you use the most to create and teach art? Sumit Vishwakarma: Apart from ArtRage, Procreate and SketchBook Pro, I am also using “Paper” and, for animation, I use “Doink” and “iStopMotion.” Our education director Caroline Mustard is an expert in Paper. CoM: What are the keys to becoming a successful iPad artist? Sumit Vishwakarma: Success is subjective. 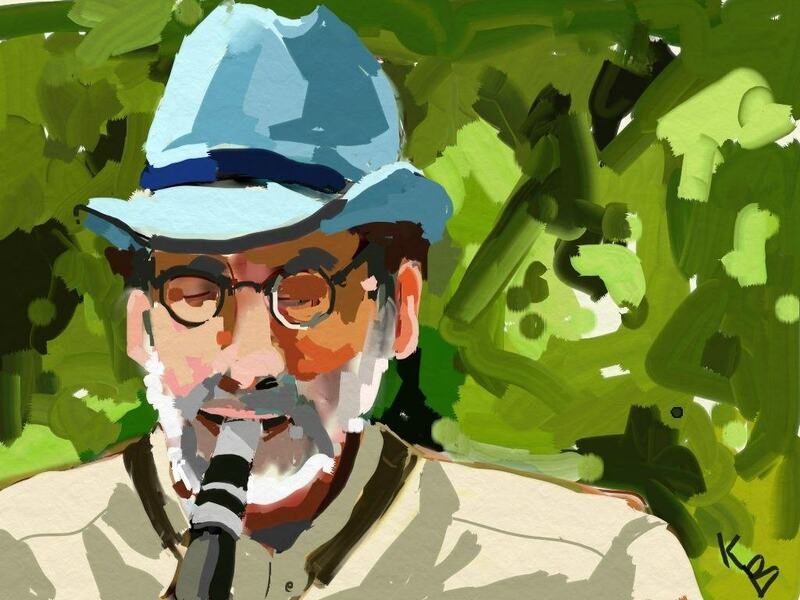 I feel, if you can create an iPad painting and you like it, it’s the first “pass.” When others like it – it’s a success! Some of us don’t even know if we are artistic. I often hear: “I am not good at art,” however, this assessment is often made in relation to producing work that is judged in terms of accuracy of representation. With iPads or smartphones you can draw whenever inspiration hits. Good art is good art, whether done on an iPad, wall or canvas. So we concentrate on empowering students to use their painting apps efficiently so they can produce what they want to create. Cult of Mac: How does your school work? Do you visit museums, schools, and teach kids there? Workshops: We are invited by schools, libraries, city parks and recreations and local art institutes where we conduct day-long workshops. Here we walk them through various art apps and techniques. The goal is to get them started with iPad art. Classes: Our classes are mostly electives and after school classes. Students are given a wide variety of projects to encourage and inspire their imaginations, including traditional drawing techniques, plein air sketching, animation and even abstract art depending on the student’s individual creative choices. At the end, each student walks away with a portfolio of digital art which they can display and share digitally or in printed format. Cult of Mac: Do kids work on their own iPads? SV: Most schools where we are invited to teach have some kind of iPad pilot program where students have access to an iPad for a pre-defined time. In our elective classes and after school most students bring their own iPads. For workshops, we ask students to bring their own iPads. CoM: Who are you teaching mostly? SV: Our goal is to empower users from toddlers to seniors, artists to scientists and everyone in between. But our most popular iPad classes are those for middle-school aged children who have an immediate grasp of the technology and start creating fast. We have even taught kindergarten kids to use Paper 53 and they do great. We even have a class of moms who bring their iPads and learn what they can do with them. And we have elderly students, including those who are retired and want to learn to paint. The best part about iPad Art is anyone who has some interest in art can create. Different apps have different uses and thus different sets of users. Some just want to draw while some wants to create professional paintings and illustrations. CoM: Is it a challenge to get those parents to take iPad art seriously? SV: Yes, as you know parents want to limit “screen time” for their kids. They are using the iPad everywhere: in homes, schools, restaurants to watch videos, play games and for social media. All these represent consumption of the iPad, but I feel it can be used innovatively to explore creativity. Once parents see the value of learning to create with the iPad instead of just play video games they get behind the concept fast. With our demo and workshop we show parents that the iPad can enable students to create and share digital content and media focusing on art and cross-curricular learning. Students can explore drawing and painting, digital photography, digital storytelling, animation and graphic design. When using iPads, mistakes can be erased and experiments are easily undertaken. This boosts their confidence and enhances creativity! CoM: How well is the “iPad art scene” maturing? What new trends are you seeing? SV: Mobile art is becoming increasingly common. From one art app in 2010 to now about 100+ art apps in the Appstore tells us there is incredible growth in this segment. Growth of FaceBook and Flickr groups of iPad/mobile artists has more than quadrupled as compared to last year. A giant exhibit of David Hockney’s at San Francisco’s DeYoung Museum highlights the influential artist’s foray into iPhone and iPad art. CoM: What printing techniques do you use to bring iPad art to the real world? SV: Apart from teaching iPad art, the Mobile Art Academy also conducts Mobile art exhibitions. 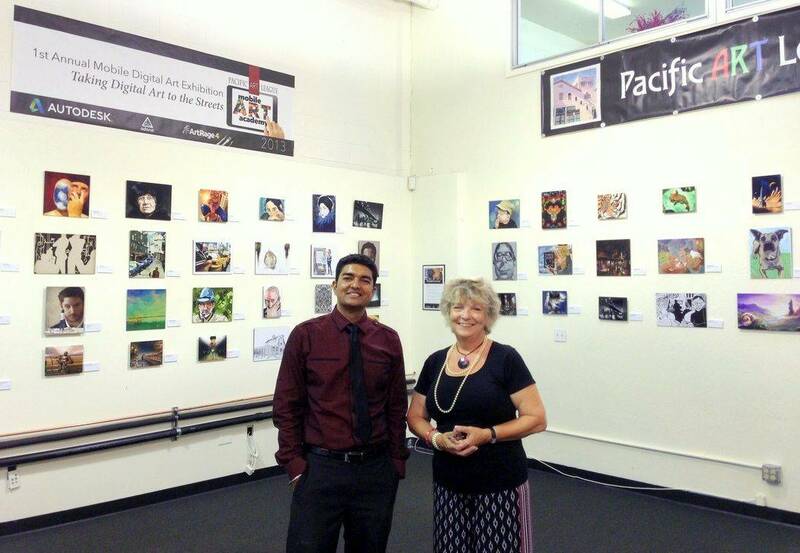 We recently did our first Mobile Digital Art Exhibition at the Pacific Art League displaying top 50 selected artworks from all over the world. We used two types of print media: metal (aluminium) prints and acid-free paper prints – the results are outstanding! There are misapprehensions that iPad- created artwork does not have high resolution. But there are apps and tools that can bump up the resolution and you can produce high-quality large professional prints. If you see what has been done with David Hockney’s iPad art your fears are quickly handled – his paintings are produced on 10-foot canvases! CoM: Do many of the kids end up selling their prints? SV: Well, during our exhibition we sold quite good number of iPad paintings. Most of our students create work for their own use. Some of our students have even published story books using their own iPad artwork (they write and illustrate their own books under our guidance). There are a huge number of growing iPad artists around the world and some of them are selling their work professionally. CoM: Why bring this stuff into the real world? SV: Technology is advancing at an incredible pace. Kids have more technology in their classrooms (and in many cases, in their backpacks) than existed in the workplaces of their parents 20 years ago. Teachers can help students become 21st-century problem solvers by introducing them to a broad range of thinking and creative tools – the iPad is one of them. The iPad can enhance confidence in creating art as students have the freedom to change every aspect of their art elements without fear – anything can be replaced, modified or manipulated. This increase in confidence and willingness to try new things makes them better contributors in today’s competitive global society. CoM: Have you run into any limitations by embracing digital? SV: Each app has its own strong features along with some limitations (different for each app). When our students encounter an app’s limitation they feel stuck. For example: an app which has a good watercolor effect is not good at creating a textured background for your flower painting. This can be overcome if you can export just the flower painting (without background) to a different app which allows you to create a great textured background. So we focus not on just using a single app but we teach them to use a workflow or app-mashing, which simply means using apps in combination. 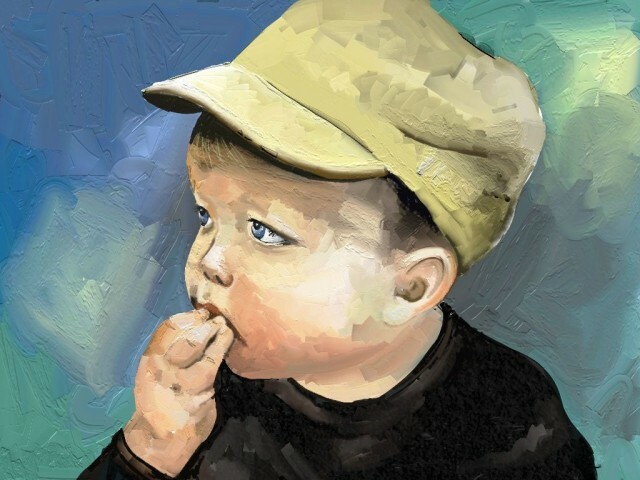 Art pieces created in painting apps can be used to create engaging animations in other apps. Students can explore endless possibilities of art making with app-mashing. Funny story: In one of our Kindergarten intro classes, when we asked, “Can you draw on your iPad?” one kid literally showed us by drawing on the iPad screen using his crayon. 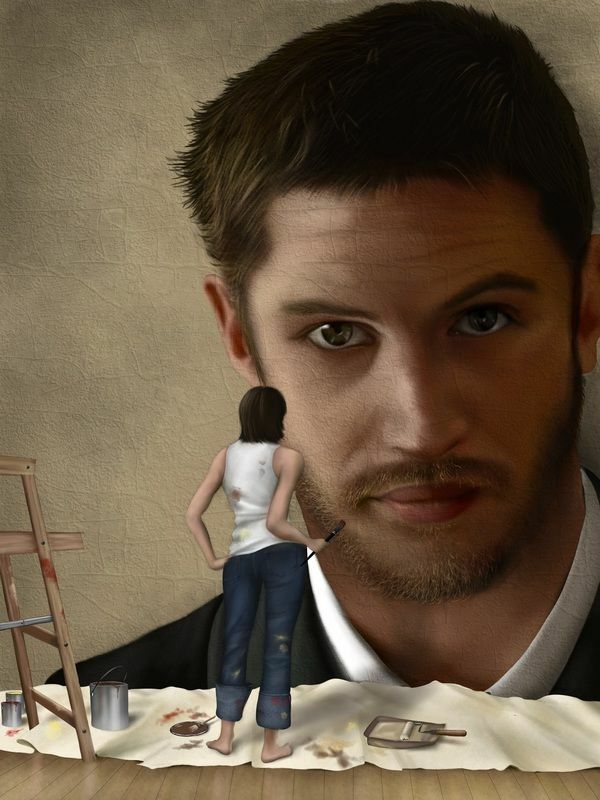 You can check out Vishwakarma’s work on his Flickr page, or at the Mobile Art Academy.